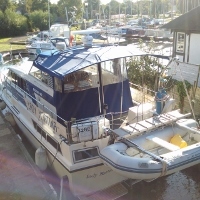 The first cruise was just a local one from our base here in Horning, taking in Hoveton Little Broad where grandson Benjamin could enjoy himself safely helming Lady Martina in open water. We then cruised on past Salhouse Broad, picking up ice creams from the boat vendor and then went up to Wroxham but there are seldom any moorings for larger craft in this congested centre and so we turned by the bridge and cruised home via the wide open spaces of Wroxham Broad where there was again lots of opportunities for novice boating and youngsters to steer. 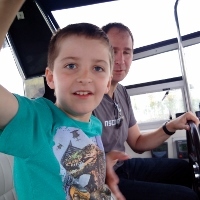 The first day of the second cruise started off in exactly the same way with my Son Daniel and grandson James enjoying the same opportunities and with us having the same result with regard to moorings. We turned back down the Bure and then stopped for a walk around Great Hoveton Broad nature reserve but could not stay long as they would not let our dog Max ashore. 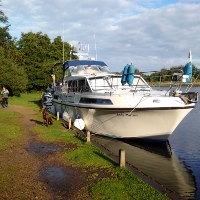 At their suggestion, we cruised over to Salhouse Broad and moored up alongside and paid their fee for the night. There was some discussion about us not mooring stern-on but it was quiet anyway and I offered to allow other large private cruisers to moor alongside if necessary and that was more than enough to reassure them. I glorious start to the next day, exercising Max around the local stubble fields and then the longish trip to Potter Heigham where we found the River Thurne levels very high from recent tides and rainfall and the banks at risk of being over-topped. A comfortable night there with Daniel helping me set up my new on-board RedBox WiFi router. This uses the mast-mounted WiFi bat aerial to glean the faintest WiFi signals from the vicinity and then beams them at power to all users aboard and it was a very satisfactory outcome. 18-26 degC; 76-46 %RH, 1015mb steady; dull and showery with sunny spells and 5- 10 knots breeze variable but mainly from the NNE.